For 13 nights of incomparable experiences and active east coast adventures, this tour ticks all the boxes for walking, wilderness, wildlife and wine. Explore Australia’s glorious east coast and enjoy an assortment of pristine beaches and delicious food, whilst also making the most of the stunning sights to be found at Byron Bay, Fraser Island and the Great Barrier Reef. You’ll start your adventure in continental Sydney and wind up in tropical Cairn, sampling wine and cheese in the Hunter Valley along the way and getting up close to cute koalas at an animal hospital. Have some fun splashing about and cooling off in pristine swimming holes. You’ll also enjoy an amazing cruise around the utterly instagrammable Whitsunday Islands. Please note: This itinerary is valid for 1 April 2018 - 31 March 2019 and the itinerary and hotels are subject to change for arrivals before these dates. Your iconic tour of East Coast Australia starts in Australia's Harbour City. 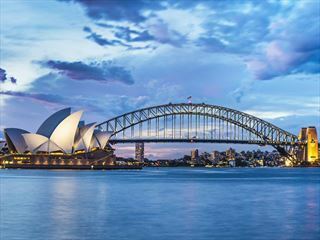 Sydney is the icing on the east coast’s cake and a great place to get your first taste of Australia. After arriving at your hotel, check in at reception and relax for a while. There will be a welcome meeting this evening at 6pm in the lobby, to meet your guide and fellow travellers and then you’ll be heading out for your first Aussie dinner. If time is permitting there are plenty of great Urban Adventures to uncover which will give you a great introduction to fabulous Sydney. This morning, you’ll be making an early start and then heading out to a local café for breakfast. Today, you’ll explore some of Sydney’s most beautiful and iconic spots on a walking tour, taking in the Sydney Harbour Bridge and the Opera House - the perfect way to get your bearings and to all the city’s highlights. Lunch is provided once you’ve stepped off the ferry at Watson’s Bay – with fish and chips on the menu. Enjoy the sunshine as you amble along the towering coastal cliffs, just be sure to keep your eyes peeled for dolphins that can often be seen swimming below. Later you can return to your hotel for some relaxation and after dinner, hit the town for a slice of Sydney’s fantastic nightlife. Overnight: Hotel. Breakfast and lunch included. 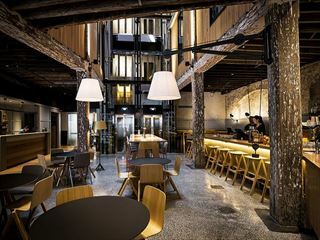 Saying farewell to the cosmopolitan delights of Sydney you’ll be taking a four-hour drive to Hunter Valley where your group will be met by your own personal ranger who will show you Australia’s koalas and kangaroos on the way to a mouth-watering gourmet lunch. Indulge in cheese, wine and chocolate too, which Hunter Valley is so famous for. This evening you will be visiting Newcastle for an exciting evening of live music and the opportunity to let your hair down. Your day will start after breakfast when you’ll be hitting Lakes Way for a pleasant coastal walk, followed by a climb up to the lookout for outstanding views across the water. There will be some free time today, so you might like to find your own perfect patch of sand on which to stretch out on the beach (don’t forget your sunscreen). For the more adventurous amongst you, why not hire a stand-up paddleboard or kayak for some fun in the sea? By the afternoon you’ll be getting ready to continue your journey on to Port Macquarie. The drive is about 3.5 hours and once there you’ll be taken on a lovely sunset cruise. The perfect end to a perfect day. Overnight: Motor Inn. Breakfast included. We’re sure you’ve been looking forward to meeting some cuddly koalas on this trip. Today is the day as you visit the cute little patients at the local koala hospital. From here, you’ll continue on for 2.5 hours to Dorrigo National Park. Fans of the big outdoors will love the lush rainforest and waterfalls here. A traditional Aussie pub lies in wait at the end of your day. Dangar falls is your first stop on today’s super fun itinerary. Adults and kids of all ages will love to splash about in Dangar Falls. Dried off, it’s then time to head to the laid-back surfer area of Byron Bay. Settle back in comfort for your 5-hour drive. You’ll visit an organic farm, where you can pick your own veggies and herbs for a healthy lunchtime treat. Later, you’ll set off for Cape Byron lighthouse. Be sure to have your camera at the ready and keep your eyes peeled for the ever-possible chance to glimpse dolphins and whales frolicking and playing off the coast. On your free day in Byron Bay, we recommend starting off with a swim in the ocean. You could also perhaps indulge yourself with a relaxing or invigorating massage, or even stretch out those limbs at an optional yoga class. It’s your day to do as you please, so just enjoy. Overnight: Hotel. No meals are included today. Noosa is one of Australia’s top spots for surfing and boasts some of the country’s best beaches. So, after crossing the border into Queensland, you’ll soon see these delights for yourself and also have the opportunity for a walk through the lovely national park. This evening, you can hit the town and experience a bit of Noosa’s vibrant nightlife. Or, why not just take it easy back at your hotel? The decision is all yours, just make sure you save some energy for tomorrow’s adventures on Fraser Island. Are you ready for some fun today? You’ll have the time of your life on Fraser Island on a once-in-a-lifetime 4WD adventure. You won’t want the day to end, as you explore the largest sand island in the world. 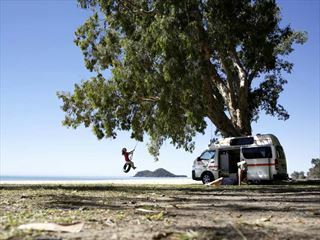 Take in the sights and chill out at some of Queensland's most celebrated lookouts, take a walk on the wild side, dive or jump into a crystal-clear lake, and go in search of dingos. After a fun-fuelled day, with adrenalin still at a high, you can carry on into the evening, enjoying the bright lights of Noosa. If you fancy just chilling, there’s always the comfort of your resort hotel to recharge your batteries for tomorrow. Travelling time today is eight hours. Today you’ll travel back to Brisbane airport for your flight to Airlie Beach, where you’ll venture on to the beautiful Whitsunday Islands. The journey will take 2.5 hours and once there, you can enjoy some free leisure time to explore, swim, or just chill out with a cool drink in one of the local bars. This morning, make sure you have your camera with you, as you set out on a leisurely day cruise around the perfectly pristine islands of the Whitsundays. You’ll be stopping at the famous Whitehaven Beach where you can snorkel amid the pretty coral and colourful fish, or just kick back on the boat for a bit of me-time. Today brings a complete change of scenery as you head through undulating cane fields to historic Tully. The drive will take about six hours, so get yourself comfortable with snacks and distractions, but be sure to take in the scenery en route too. You'll meet an Aboriginal family who will take you to a secluded swimming hole in the heart of the rainforest, for a unique and authentic Aussie experience. You'll also have the unique opportunity to test out your skills in Aboriginal art. You’ll be guided by local Jirrbal Aboriginal Artists on some of their traditional techniques after a tour of the Ingan Cultural Centre. Your artistic endeavours will be followed up with a fascinating discussion on Aboriginal culture, history and contemporary life for Indigenous people in Australia, followed by a delicious BBQ. Up bright and early, you’ll have breakfast in a local café before you head off on a three-hour drive into the wet tropics of far north Queensland. You'll discover an impressive plunge waterfall nestled in dense tropical rainforest on your way to the Atherton Tablelands. Take a refreshing dip in the pleasant water before you head to Lake Eacham, a crater lake with crystal-clear water. Next, you’ll visit the massive ‘Curtain Fig Tree’ before you day comes to an end in the energetic city of Cairns, one of Australia's most vibrant and tropical metropolises. You can’t visit Australia without seeing the Great Barrier Reef and today’s the day! You will cruise around the reef, go snorkelling if you wish to and then store up some interesting facts as you learn about the conservation efforts to ensure the Reef remains an incredible world wonder for centuries to come. This evening, you and your travelling buddies will enjoy a farewell dinner in Cairns. Your adventures come to an end here. If you've got time though, why not book some additional nights in a hotel and spend a few more days in Cairns? There’s so much to see and do, you’ll certainly be kept busy in Cairns. Overnight: Breakfast, lunch and dinner included. Sydney city sights tour. Hunter Valley wine, cheese, chocolate and organic vodka distillery tour. Wildlife Park. Port Macquarie sunset cruise. Lakes Way coastal walk. Koala Hospital - Port Macquaire. Byron Bay farm to plate organic lunch experience. Flight Brisbane to Airlie Beach. Whitsunday Islands sailing. Tully Indigenous Experience. Great Barrier Reef day cruise.